The earliest surviving paintings in Japan are the murals on the walls of the temple ofHoryu-ji in Ikaruga, Nara, illustrating episodes from the life of Buddha, the Bodhisattvas, and various minor deities. The murals remind of us Chinese paintings from the Sui dynasty in China. By the mid-Nara period, wall murals in the style of the Tang dynasty were popular. The style evolved into the Kara-e which remained popular into the early Heian period. The arts of the Nara period largely served the expanding Buddhist culture centered around Nara and later Mount Hiei. Kara-e enjoyed high prestige as many cultural qualities were introduced from China and Korea into Japan. The Nara Period was characterized by strong diplomatic ties with China, at the time ruled by the Tang Dynasty, which consequently influenced art in Japan. The Kara-e style was thus born, using typical Chinese elements such as imaginative landscapes, wide, free brushstrokes, and a relatively truncated depth of vision. Yamato-e replaced the previous Kara-e style of the Nara Period during the Late Heian Period; it continued to dominate well into the Kamakura Period. The yamato-e depicted Japanese subjects and scenes from Japanese life. The pictures are non-symbolic and often depicted the beauty of nature as Buddha's incarnation. The pictures were often on scrolls that could be hung on a wall or on handscrolls with the accompanying story or on a folding screen like the example here. In the Heian Court, women's groups were very active and influential culturally. They influenced the style of painting until two kinds began to emerge. Men's paintings (otoko-e) exhibited strong calligraphic outlines and figures with washed colors so that the colors would not overwhelm the strength of the design. The topic of the paintings was most concerned with public life or life outside the house. In contrast, women's paintings (onna-e) focused on activities that might be seen within a room or house and the well-known "cut-away" perspective is unique to the media. The viewer seems to be looking down into a house from which the roof has been removed. The greatest artistic medium (emakimono) developed in the late 900's and was used to illustrate stories and books. The greatest of these scrolls was the Genji monogatari emaki, the illustrated Tale of Genji. The picture below illustrates the otoko-e style of painting. You will remember that Prince Shotoku and other leaders from the 6th and 7th centuries worked to bring Chinese art, language, writing, science, philosophy, and Buddhism to Japan. The artistic style (Sumi-e) came to Japan via China and Korea. Initially brush painting was most popular with the daimyo (nobles) and aristocracy, but like literature it eventually found its way to the masses. Nature was the favored topic of brush paintings (flowers, birds, mountains, trees and water features especially bringing out the four seasons). Brush painting was influenced by Zen Buddhism emphasizing nature and meditation. Often you will find a poem associated with the painting to add depth to its message. The black ink comes in a stick and is made from vegetable carbon (lampblack) and glue. It is molded into a form and fired in a kiln (pottery oven) to become an inkstick. To prepare the paint, the stick is ground with water in a circular motion on a slate stone. A tsuketate, is a type of brush used for sumi-e. Sumi-e brushes are traditionally made from bamboo, and goat, ox, horse, or wolf hair. The brush hairs are tapered to a fine point, a feature vital to the sumi-e painting style. 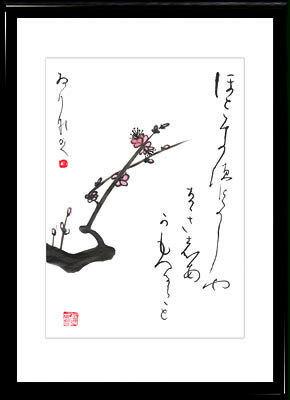 There are four main brush strokes used in sumi-e, called the "Four Gentlemen" ¡ª the Bamboo Stroke, the Wild Orchid Stroke, the Chrysanthemum Stroke, and the Plum Branch Stroke. The strokes used to paint these four plants are the basis for everything painted in sumi-e. After the painting is complete, the artist stamps their "signature" in red ink upon the painting. Here is a beautiful example of a brush painting that includes script. a publisher, who thought of the project, directed all aspects of the production, and marketed the finished prints. a designer, who worked under commission from the publisher and created the image that was to appear on the print. a carver (more accurately - a group of carvers, some of high experience, some of lesser ...), who took the illustration from the designer and carved it in wood. a printer (again - sometimes a group of printers), who produced the actual prints from the carved blocks. Other people were certainly involved, a skilled worker to transform the designer's 'free' sketches into a detailed tracing for the carver to follow, a papermaker, etc., but it is these four whom we now see as being the principle constructors of the woodblock print. Finally some examples of Ukiyo-e tied to artist names. Look at the artist name and their style. Begin to develop a familiarity of style to artist. Be sure to click on the thumbnails to obtain the best resolution.